Nutation dampers are used to dampen the undesirable set of forces correspondent with spinning bodies known collectively as “nutation.” This nutation, or wobble, when not properly dampened, causes erratic behavior of the spinning body. 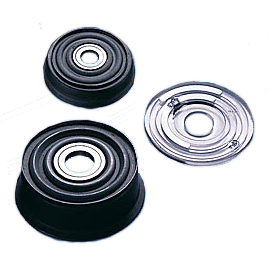 Glass nutation dampers are fabricated with customer-specified single or multiple races that contain a finite amount of appropriate high-density liquid. State-of-the-art, glass-to-glass fusing techniques provide the necessary hermetic-sealed housing that assures long-term life and performance. 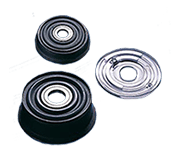 Metal nutation dampers are manufactured with single and dual races with customer-specified race height, width parameters, and fluid fill weights. Electron-beam welding of the damper components produces an excellent housing for the high-density fluid for long-term performance and reliability.